Here is a picture that was mailed to us by an "anonymous sender." This appears to be an actual photo. 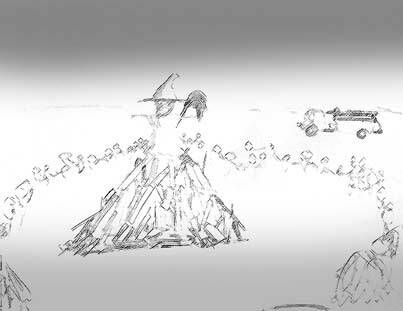 However, until we can confirm it's authenticity, know that this image looks exactly like the witch burnings in Lisle. This drawing shows a rough representation of the event. Watch the opening of Creature Features! This video still gives me chills. every Halloween event I can remember. Talk about the most "politically incorrect" celebration possible. And it all took place in our sleepy little town! Nobody called the ACLU! Nobody yelled WITCHCRAFT!! Nobody called the Environmental Protection Agency! Nobody even called a lawyer complaining of "emotional" distress. Nope, this was just good ol' fashion fun... Without all the whiners that have taken all the fun out of most things now days. It was all quite simple actually.. The "Village" would find an old building or barn that was slated to be torn down. They would save the wood until Halloween. Then, on Halloween, they would make this huge pile of wood in the grass playground behind Main Street School. Then they would make a big stuffed witch (from the waist up) and place it on top of the wood pile. That night, after trick or treating, everyone met down at the "witch burn." In the days of only five television channels, this was the ultimate event! On the "kid scale" of one to ten??? This was a twelve! The "MOTHER" of all Halloween events! It started at seven o'clock so it was already pretty dark out. Most Halloweens in Lisle were pretty cold but things heated up pretty fast. When we'd arrive at Main Street School, they'd always have that same Halloween record playing over and over! It seemed like everyone played that SAME damn recording everywhere you went! For years! Eventually the men took these huge gas cans and dowsed the wood pile with gasoline and lit the fire. The Lion's club guys would have everyone form circles around the fire and slowly rotate everyone around the fire. Sometimes there would be 3 or more circles going at once. Then they would hand out those little "Lions Club" roll candies. (Like the ones they would sell every year to people in their cars waiting at the light on Main Street) They would then inspect everyone's costumes and look for the best. Unfortunately, one year my mother and sisters dressed me as a girl and I won the costume contest! I'm still wondering if I may have issues from that experience today? The highlight of the night is when the flames reached the witch. I'll never forget everyone screaming.. Oooh... Aaah! And of course, The Lisle Fire Department always had a couple of their cool trucks near by. 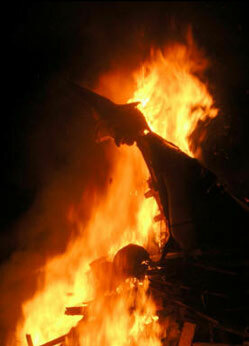 One truck was used to shine a green light onto the witches face to make it glow in the darkness before the fire began. For SO many lame reasons. First, the fire's glow would illuminate the massive billows of smoke rising to the sky and the sparkling embers would dance from the fire and shoot strait up into the cool night air. So awesome!! BUT! The light from the fire could keep the neighbors awake, the embers could ignite some kid's costume or a nearby house and the smoke is sure to increase the "ozone layer hole!" Second, burning a witch?? In Lisle?? Imagine how many people you could offend now days! And Why couldn't we burn a "male warlock" huh?? Jerry Springer could have a whole panel of offended witches on his show. And surely Lisle would have to pay hefty compensations for their mental anguish! Third, think of how many non-witches would sue because they don't believe in witchcraft and they feel that Lisle should play no role in promoting it on Halloween night or in our schools! 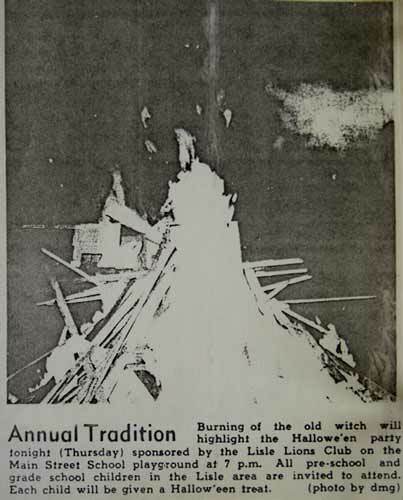 I'm not exactly sure why they stopped having the "witch burnings" in Lisle. Instead, Lisle decided to just have a haunted house inside of Main Street School. It was one of the best around! A large witch head was set up out side next to where the line was to get into the haunted house. And yes, they played that same ol' record outside and throughout the building over and over and over.... Eventually the haunted house and the witch went away for good. No telling how much the liability insurance was for such an event. I'm sure it was huge. The current Lisle Fire Department now sits on what used to be the area where the witch burnings took place. 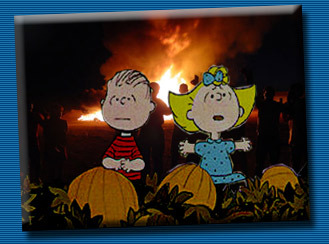 Maybe someday we could have a Halloween "bon-fire" for old times sake. And if we do? Instead of having a witch on top of the fire, maybe a stuffed attorney would do.